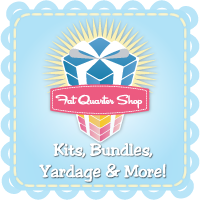 Mauby's: Fat Quarter Fun! Mini Bolster Pillows! With just two fat quarters, a bit of ribbon and some stuffing you can have two mini and cute bolster pillows! 1. Cut 6" off of the 22" length of each fat quarter, so that they both measure 16" x 18". 2. Cut the 6" pieces in half lengthwise so that you have two 18" by 3" pieces. Sew each matching strip together to get two long 26" by 3" pieces. These pieces are to be used for decoration on the pillows. 3. Decide where you want to put your strips. You can make them into ruffles and sew it on the middle of the pillows or just straight line across (the length of the pillow will be the 18" edge and the 16" edge will become the circumference). 4. After you attach your embellishment strips, fold over the 16" edges 1". Press and stitch with 1/4" seam allowance from the raw edge. 4. Then fold over the 18" edge 1" and again 1" to close in the raw edge. Sew with a 1/4" seam allowance from the edge of the fold. 5. Fold the entire rectangle in half lengthwise, so that the rectangles now measure 16" x 9". Sew ONLY from stitch line to stitch line created in the previous step. 6. Turn the tube around right side out. 7. String one end with the decorative drawstring. Pull it closed and tie a bow or a knot. 8. Stuff the pillow and repeat step 7 with the other end.